It reminded me strongly of the waning moon and linear mod art projects that I’ve been playing with. A quick intro: the picture above was made by taking 360 points around a circle, and shifting them by the function (y = 56x), and then graphing a line between the input and output. If the output is greater than 360, then take the remainder after dividing by 360. 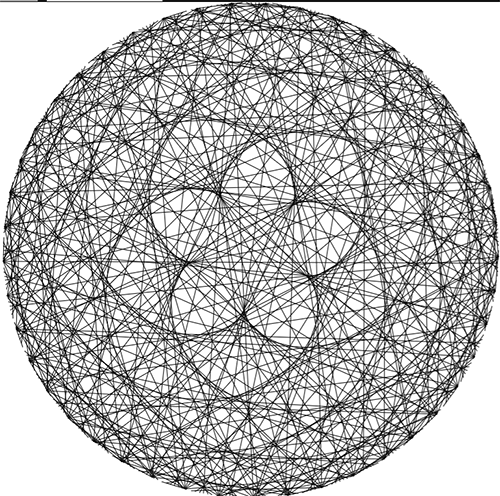 It’s called the pentagram of Venus, because it has 5 ‘lobes’ where Venus makes its closest approach to Earth. At each closest approach, Venus move backwards compared to its usual motion across the sky: this is called retrograde motion. That’s pretty close! So in 8 Earth years, Venus goes around the Sun almost 13 times. Actually, it goes around 13.004 times. Hey do you recognize what that ratio is close to? Anyway, there’s a lot to investigate here. How is the function y = 56x related to these planetary orbits? I love this. Despite having been an astronomy undergrad, it was new to me last year. Here’s a GGB I did where you can set it for different planets. http://tube.geogebra.org/material/show/id/67741 Not perfect, but fun. Whoa, that’s really cool John! I’m gonna have to play with the geogebra to see the parallels to the line art thing. Thanks!